Banh Mi Bowls, you ask? That’s right: quinoa or rice topped with quick pickled carrots, herbs, peanuts, and easy lemongrass pork meatballs all covered with spicy mayo. <– this is a thing. This recipe is sponsored by Wholesome!®. Guys. I am so digging the bowl lifestyle! Today’s banh mi bowl is inspired by a banh mi (traditional sandwich style), which I’ve only ever eaten once, which makes me a banh mi loser. I acknowledge this fully. While my one and only banh mi experience was really good (good enough obviously to inspire a re-make-bowl-version), I found that all that white bread got in the way of all that’s good in the banh mi. Do you know what I mean or do you hate me for my blasphemy? Just gimme the stuff that has tons of flavor, so the meatballs, the pickled vegetable salad, the herbs, the spicy mayo, the pate – except no pate on this homemade bowl version, srsly WHO DO YOU THINK I AM? – all of these ingredients are mostly what I’m wanting to eat when I think about a banh mi. It’s not that I’m against white rice or white bread – have you even read this blog? AS IF, guys. It’s more just that I’m hungry for food that will kick my tastebuds awake which means bowl-form, heavy on all herbs and sauces, is the way to go. Bowls in general are all about layers. So let’s start with the base layer to this banh mi bowl: you can choose to build your banh mi bowl on rice, quinoa, rice noodles, or I guess just lettuce if you want it to taste like heartbreak (but don’t do that). Some kind of basic carb situation would be my suggestion. I chose black/red quinoa – mostly because it’s all I happened to have on hand at the moment. Exhibit A with the red quinoa stand-in: bowls are extremely versatile. Next layer: on top of the quinoa base, we’re going for a pickled vegetable salad which sounds totally intimidating and really just means shredded or julienne cut vegetables soaked in rice vinegar and sugar for about an hour. That will do it, friends. I should mention that we are using coconut palm sugar in this recipe which is a big time bonus because it’s a delicious, unrefined brown sugar that doesn’t taste like coconut (that might get weird) – instead it has a deep caramel-lush-ous flavor that is just begging to be featured in Asian sauces of all sorts. Also lovable: this sugar is actually made by the cooperative farmers in Indonesia who tap the nectar of the coconut palm trees, kind of like you might imagine a northwoodsian tapping a maple tree for syrup. The nectar gets heated over fire until it reduces down to granulated sugar, because OBVIOUSLY. It just had to be that cool. Guys. I love Wholesome! I loved them before they were trendy and now – bonus – they’re trendy! so you can buy their organic, fair trade products at non-exotic locations, like, for example, Regular Person Target. THANK YOU LIFE. Next layer: over the quinoa and pickled salad, let’s throw a handful of crushed peanuts and every possible herb that you could ever have in your fridge ever. I went crazytown with green onions, cilantro, basil, and mint. I did not regret it. Next layer: now we come to the crown jewel of this recipe, the thing that carries most of the flavor: THE MEATBALLS. Can I just tell you this? My sister, who used to be a vegetarian, is working with us this summer. On the day I made these, she sampled one out of the fridge after I left and she specifically sent me a text to tell me how good they were. Former vegetarian, guys. Loving the meatballs. These are really really good meatballs. They are little crispy gems of pork, lemongrass (I just buy that paste in a tube from the produce section – my life has no time for locating and deconstructing fresh lemongrass sorry not sorry), sugar, and fish sauce which sounds totally scary but it’s so utterly life-changingly delicious. Please try. Final layer: spicy mayo // mic drop. I am totes making this for dinner club this month. Bring on the lemongrass meatball banh mi bowl party. Banh Mi Bowls! 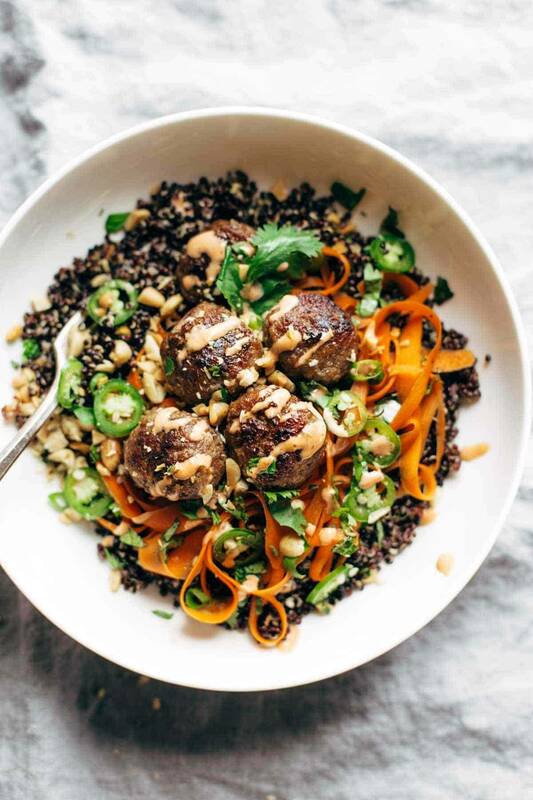 A quick and easy meal featuring quinoa or rice topped with quick pickled carrots, herbs, peanuts, and easy lemongrass pork meatballs, all covered with spicy mayo. Quick Pickled Carrots: Whisk the rice vinegar, palm sugar, sesame oil, and salt together. Soak the carrots in the mixture for one hour. Meatballs: Mix all ingredients. Roll into small meatballs with your hands (they might feel wet and heavy – pop them in the fridge or freezer for a few minutes to get them to hold their shape a bit better). Heat a little bit of olive oil over medium high heat. Add the meatballs and fry until golden brown on the outside and fully cooked (not pink) inside. Bowls: Layer the carrots and meatballs over quinoa, rice, or noodles. Top with herbs, peanuts, sesame seeds, and/or spicy mayo. I would feel happy for you if you also added an avocado. Nutrition information is for 1 out of 4 bowls (meatballs, veggies, and rice using a total of 1 cup uncooked rice) and does not include spicy mayo sauce. Thanks to Wholesome!® – makers of this Organic Coconut Palm Sugar – for partnering with us for this post! And for being a brand that we love and respect. And thanks to you, readers, for supporting the brands that do food right. i used to love your site but all of your dishes are starting to look exactly the same! the same bowl, the same colors, the same type meals the same thing!! how about some sweets again or something just different? Hi Deb! Great news – there are tons of food blogs in the world which cover a wide range of recipes! 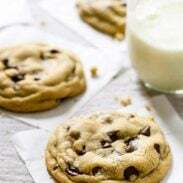 Here are some of my favorites to help you find some variety in your recipes: Sally’s Baking Addiction or Joy The Baker for baking recipes, Sprouted Kitchen or Cookie and Kate for vegetarian recipes, Gimme Some Oven or Damn Delicious for easy family recipes, My Name is Yeh or How Sweet Eats for unique and creative ingredient combinations. It’s a big world out there! Take care! Perfect response. love you and your blog, Lindsay! Your recipes are always a hit at my house, keep them coming! We must be channeling each other today! i just posted a recipe for vegan meatball bahn mi sandwiches. loving the inspiration behind this recipe, Lindsay – can’t wait to try it! no way! I love it! 🙂 I’ll have to check it out. Hope you’re doing well Anetta! that IS a fun fact and I did not know! 🙂 thanks for the comment Mette! Ha-ha! Can’t believe I also knew this factoid! I work with a Vietnamese lady and once I’d finished butchering the pronunciation (!) she laughed and said – I have Bahn mi for lunch and showed me. Sure enough – it was a sub roll!! OK I’m totally biting the bullet and buying a bottle of fish sauce after your recommendation. Can’t wait to make this – looks fabulous. BTW I love your photos and look of the site! Lemongrass meatballs sound so delicious! looks really good. it looks like there are jalapeno’s in the pictures. If so, what kind? serrano peppers! just added that. 🙂 Thanks Barbara! holy cow this looks good! I can’t wait to try it. Thanks, ZJ! Hope you enjoy it! This looks so much better than most of the restaurant meals! I 100% need this in my life now. Totally my jam. Your dishes don’t look the same, and I think you’re rocking it out with all the awesome recipes you’ve been pushing this spring/summer. Keep up the great work Lindsay! I’m so into a bowl lifestyle 😀 Lovely idea! I am loving Bowl Meals. Do you think I can bake the meatballs ? Definitely! We’d bake them at about 400 degrees. Do you have an estimate of how long they’d take to bake? We haven’t tried so not totally sure, but I’d estimate about 15-20 mins! Sounds amazing! 🙂 Glad you enjoyed it, Jane! I love banh mi – without the bread, this is amazing! I then scroll down to leave a comment and see several more mouth watering bowls?! Thank you for sharing these recipes! This looks fantastic! I love your recipes and have made many! I can’t wait to try this one! as a Vietnamese, I approve! tHESE LOOK PHENOMENAL! Thanks so much, Cassie! 🙂 Means a lot! These bowls look amazing lindsay! any chance you have the nutritional info, too? Hi Julia! Thanks for catching that. 🙂 We’ve just added the nutritional info! Thanks! Look, for a moment there I was a little judgemental because there was no white bread roll or pate involved – Bahn Mi blasphemy at its highest – but having looked at the photos, read about all those delicious layers I have completely forgotten about bread and pate and just want a huge bowl of this all to myself! Looks amazing! Hope you enjoy it, James! I’ve made a bunch of your recipes in the past, but this one was such a hit with my girlfriend that I felt inclined to offer my gratitude 🙂 I obviously enjoyed it immensely as well. The meatballs were superrrr super tasty, combined with the tangy carrots and the balance of the quinoa really made it a winner. An FYI to anyone else out there making this bowl, I couldn’t find Coconut Palm Sugar or Lemongrass paste…I used brown sugar and lemon zest instead…I think they filled in nicely. Thanks again, Lindsay! Keep killin’ it. Way to improvise! Thanks so much for the comment! These looks absolutely epic! Can’t wait to try! I love these meatballs! I used ground chicken breast and doubled the recipe because I have faith in your recipes. (Going to freeze some for a rainy day.) This lucky girl had some leftover coleslaw from your fish tacos, so threw that in the bowl as well. Thanks for another great recipe. Sounds delicious! Thanks for the comment, Sarah!